Cephalexin and blood sugar level? QUESTION: Cephalexin and blood sugar level? 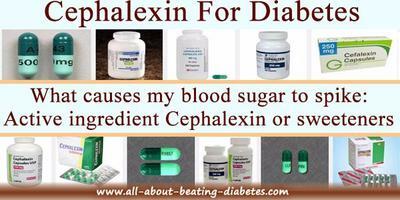 Does cephalexin increase blood sugar or lower it? As you probably know, cephalexin is antibiotic, which means that it has the ability to kill bacteria. In addition, I would like to inform you that the invasion of certain bacteria is considered as stress for the organism. Because of this, the organism has to find a way in purpose to remove the bacteria and generally this “fight” requires a lot of energy and glucose respectively. This explains why when you are ill your blood glucose is high. However, when you are using antibiotic, the invader is removed and the stress for the organism is wiped out. Of course, there is no need for a lot of glucose (energy), which means that you glucose will come back to normal, or it will become lower, depending on the diabetic treatment during the infections. Moreover, I need to inform you that Cephalexin is the generic name of the antibiotic; while you can find it under a lot of brand names. However, you have to remember something. When certain company produces cephalexin, or any other drugs, it is allowed to add certain ingredients to the formula. In other words, when you buy certain brand name of Cephalexin, you will get other substances as well. 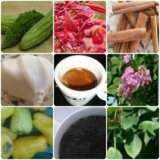 In addition, I have to tell you that some companies add glucose, or other sweet substances in purpose to improve the taste of the pill or of the beverage. As you can imagine the usage of antibiotic, which has glucose in it as sweetener, will damage your blood glucose control, by causing spikes in your blood glucose concentration. So, speak with your doctor about such things, when he is prescribing you antibiotics no matter their type. I have experienced this same phenomena since I started a course of Cephalexin. Readings went from 120's-130's to 150's-180's. Other online opinions on this seem mixed. Perhaps it's time for some clinical tests so that warnings can be posted. Comments for Cephalexin and blood sugar level? I have been prescribed cephalexin 500MG for a very bad allergic reaction. The problem is my blood sugar went up to 267 it normally runs about 115. I will retest it in the AM. 1. First let me explain that cephalexin is an antibiotic. It is used to treat bacterial infections. Usually, we do prescribe it for a bacterial infection of the skin, lungs, or others. We do not prescribe for allergy reaction. 2. You are worried because you found that your blood sugar levels raised up to 267 mg/dL. That's a bit high in fact. - you had an allergy reaction. That will increase your blood sugar as it is considered a stress situation. - it's true that Cephalexin can raise blood sugar but not at this point as in your case. There is something else going on here. After getting the results, send to me to evaluate them adequately. Perhaps you had an impaired blood glucose before taking Cephalexin, and its use has triggered it. Hope this helps. Let me know if you have any other concern. Cephalexin effect on fasting blood sugar? I tested my blood sugar yesterday morning,it was 118 normal for my fasting test. I got a prescription of cephalexin for chest/lung infection,this morning my blood sugar is 191 fasting,it has never been over 138 fasting? Thank you for trusting us your medical concern. I advise to keep monitoring your blood sugar levels, and record the results for reference. Meanwhile, continue taking cephalexin as prescribed by your doctor. I also advise to run HBA1C test to evaluate the mean of your blood sugar the last 3 months. Try to be careful with foods you consume; try to be physically active. QUESTION: My mother is diabetic and was recently given cephalexin to take 4 times a day. In morning level is normal. As the day goes on by time for her 3rd dose about diner time. Her sugar is at about 186 and at bedtime close to 200.. is that normal with this med? Your mother's blood sugar levels are acceptable although she is taking cephalexin. I advise to continue taking this antibiotic as prescribed and to take other hypoglycemiant agents as recommended by her doctor. Be careful with food she is eating; diet is also very important. In general, her blood sugar levels are ok.
Let me know if you have other queries. QUESTION: My blood sugars have gone up after taking Zirthomax. Azithromycin. I called doc and waiting for his response. It has raised my blood sugar in the morning by about 30-40 points. Zithromax is the brand name for the antibiotic Azithromycin. I believe you are taking pills form and not suspension. Now, azithromycin can alter liver function sometimes. As liver is responsible for accumulation and production of glucose in the body; alteration in its function can cause oscillations in blood sugar too. My blood sugar also went up 100 points after I started taking cephalexin. Thank you for sharing with your your concern. If you think that your blood sugar level went up 100 points after started taking cephalexin, I advise to report this to the doctor who prescribed cephalexin. You might need to change therapy or adjust the dosage of current hypoglycemiant medications.